Winter pool sessions have begun. Come practice those skills. Its better to roll than swim, especially when the water temperature is only a little north of ice. Scheduled most weekends January thru early April; Thursday nights in Lebanon. – The Climb (VT)—Not This Year, Sorry. Click here to pay via the payment page. $20/session (paid on-line in advance). $25/session (on-site credit-card, cash, etc). $85/Season Pass (good for all pools). $90/Three-session Family Pkg (2 Adults+Kids). $5/Children 15 and under (with paying adult). Student/Instructor groups can pay per/boat. We're still working on Boston? washed off, etc.) Talk to Skip to volunteer. etc. Free for students, $10 all others. Info here. Campus Outdoor Adventure info here. Open practice $20/session; Instruction $50–$75/session. Info here, more info this Meetup Group. Mondays 7:45-8:45pm Feb 6, 13, 20, 27. $20/session. Details at this facebook group. Practice $80, Rolling Instruction $130 Info here. $25+ACA Fee; NSPN membership required. Info here. Feb 7, 28, Mar 6, 13. More info here. 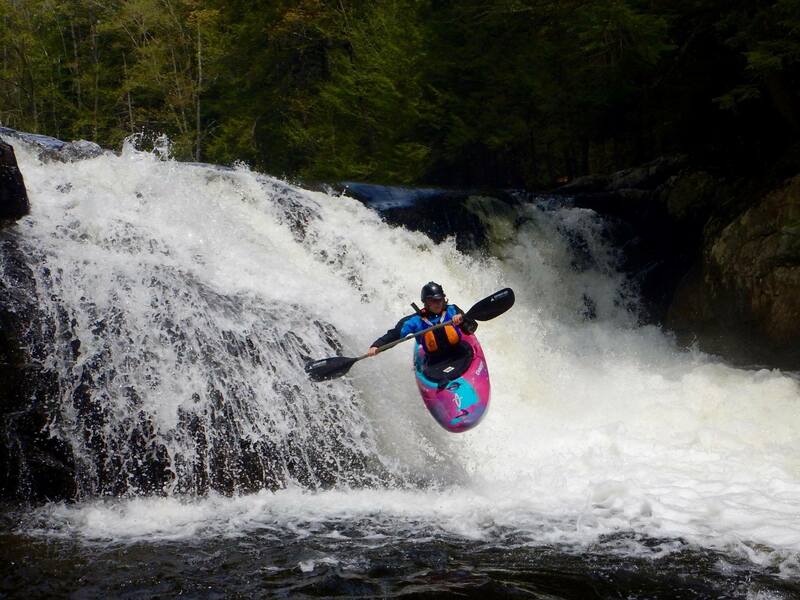 WW Kayak Instruction 3-4pm: Jan 22, Feb 5, 19, Apr 9, 23. Members: $5, Non-Members: $7. Info here. Go here to pay via payment page. Follow I-293 (either direction) into Manchester to Exit 5/Granite Street. Follow the signs for "Elm Street/Downtown/The Millyard/Canal Street" to put you on Granite Street Eastbound. Cross the river on the Granite Street Bridge; drive part-way up the hill, cross over the RR tracks, turn left at the light onto Canal Street (by the bus terminal). Follow Canal Street a little under half-mile, turn right at the light onto Mechanic Street. The YMCA is almost all the way up the hill on the right. Park anywhere along the street. The YMCA front doors will probably be locked; for the pool entrance walk back down the hill, go around the corner at the end of the building and down a small alley. Thru the gate, up a couple stairs, then thru a twisty-little-maze into the pool. Sea Kayaks and Canoes – Turn righ onto Market Street (2 blocks before Mechanic Street), up the hill to end at City Hall (with the Mayors parking spot in front of you), turn left into the alley that goes along City Hall. Follow the alley across Stark Street. Look for the Bean and Bagel Shop followed by the Hearing Aid Store on the left. The small gate behind the Hearing Aid store (with the "no parking" sign) leads to the pool. Drop off your boat here (parking at the Hearing Aid Store or on the street is ok), and walk around to the other side of the building since you'll have to open the door from inside. (Note: We checked, and a 16-foot Wilderness Tsunami Touring Kayak just fits thru this entrance with 2-1/2 inches to spare. Sea Kayaks and Canoes should probably consider using the Nashua pool since the pool is bigger and access is easier.) Note: The back will be locked; walk around and enter the front first. From the highway, take exit 5A (That's Five-AEY), not 5E or 5W. Northbound go past exits 5E and 5W; exit 5A is another couple hundred yards north. Southbound is easier to do a U-Turn at Exit 5 and come north to exit 5A. Go straight thru the first intersection, then you'll pass a school on the left. The B&G club is just past the school on the left behind a large baseball field. Turn left at the end of the baseball field and follow it all the way around. If you use a GPS to get directions be aware that other folks have been led down the wrong side streets. The B&G Club is the building at the FAR CORNER of the ball field. So keep driving along the field, don't turn down the side streets. To get to the pool, drive PAST the front entrance, turn right at the end of the building and go about 100 feet. The pool entrance for boats is halfway down the back end of the building. 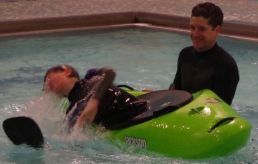 For Sea Kayaks ask the lifeguard to let you in the back entrance where it's a straight shot into the pool. Take Interstate-89 to Exit 18 (Route 120 North). Go about 2-1/2 miles, turn right on Centerra Parkway, go a couple hundred feet and turn right again onto Morgan Drive. Follow Morgan Drive about a quarter-mile as it curves to the left. The River Valley Club is on the left. Go past the club parking lot and turn left into the driveway at the far end of the facility. Drive down the right side of the building; enter the pool via back door. Important Note: The Lebanon Pool is a Salt Water Pool!!! Directions: Near Mt Ascutney, attached to the Holiday Inn Hotel. Drive in along the right side of the facility; enter the pool via back door.